I met with the organisors of an Arab-Jewish girls football team over breakfast this morning! I talked to Amnon Shenk from the municipality of Jerusalem, who support this venture and Nihad Masarw, who has long experience of organising similar trips. As we were chatting, the 17 strong team of relaxed 17 and 18 year olds gradually emerged from their beauty sleep and came to breakfast. The hubbub of friendly conversation gradually rose in the room. The team are here as part of a 30yr long sports exchange between Jerusalem and Berlin. Even better, one of the teams they are playing is a mixed German team of Turkish and German cultural backgrounds. 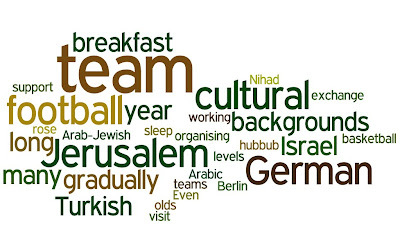 This is a fantastic idea, working on crossing cultural and historical differences on so many levels; Jewish & Arabic within Israel, Germany and Israel, Germans of Turkish and German cultural backgrounds. The return visit to Jerusalem will be by a basketball team later in the year. The first football game is on Saturday. I wish them Good Luck!